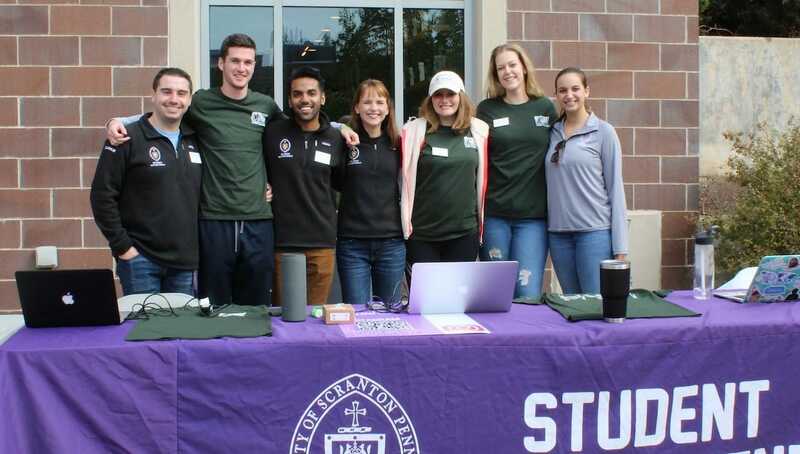 Student Government officers helped organize the hundreds of University students who participated in this semester’s Street Sweep are, from left: Matthew Coughlin, president; Jack Prendergast, director of technology; Fahad Ashraf, vice president; Madalyne Sunday, director of communications; Paige Nonnenmacher, executive treasurer; Marlene Geerinck, executive secretary; and Kimberly Barr, chief of staff. Hundreds of University students volunteered to clean-up streets near campus, downtown, at Nay Aug Park and at two community gardens during the fall Street Sweep on Oct. 14. Student Government officers who helped to organize the Street Sweep are: Matthew Coughlin, president, a political science and philosophy double major from Jenkintown; Fahad Ashraf, vice president, a biology and philosophy double major from Clarks Summit;Paige Nonnenmacher, executive treasurer, an exercise science major from Avenel, New Jersey; Marlene Geerinck, executive secretary, an international studies major from Riverdale, New Jersey; John (Jack) Prendergast, director of technology, a computer science major from Malvern; Madalyne Sunday, director of communications, a biology major from South Abington Township; and Kimberly Barr, chief of staff, a biology and philosophy double major from Nazareth.